The bottle-neck in most cloth simulation systems is that time steps must be small to avoid numerical instability. 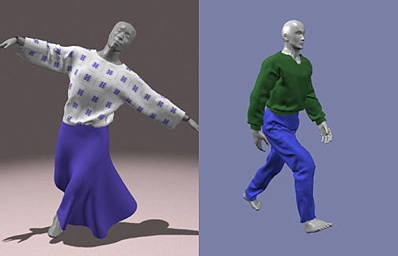 This paper describes a cloth simulation system that can stably take large time steps. The simulation systemcouples a new technique for enforcing constraints on individual cloth particles with an implicit integration method. The simulator models cloth as a triangular mesh, with internal cloth forces derived using a simple continuum formulation that supports modeling operations such as local anisotropic stretch or compression; a unified treatment of damping forces is included as well. The implicit integration method generates a large, unbanded sparse linear system at each time step which is solved using a modified conjugate gradient method that simultaneously enforces particles' constraints. The constraints are always maintained exactly, independent of the number of conjugate gradient iterations, which is typically small. The resulting simulation system is significantly faster than previous accounts of cloth simulation systems in the literature. David Baraff, Andrew P. Witkin (1998). Large Steps in Cloth Simulation. Proceedings of SIGGRAPH 98, 43--54.